Arduino library to generate Morse code. Generate morse code on a digital output pin. 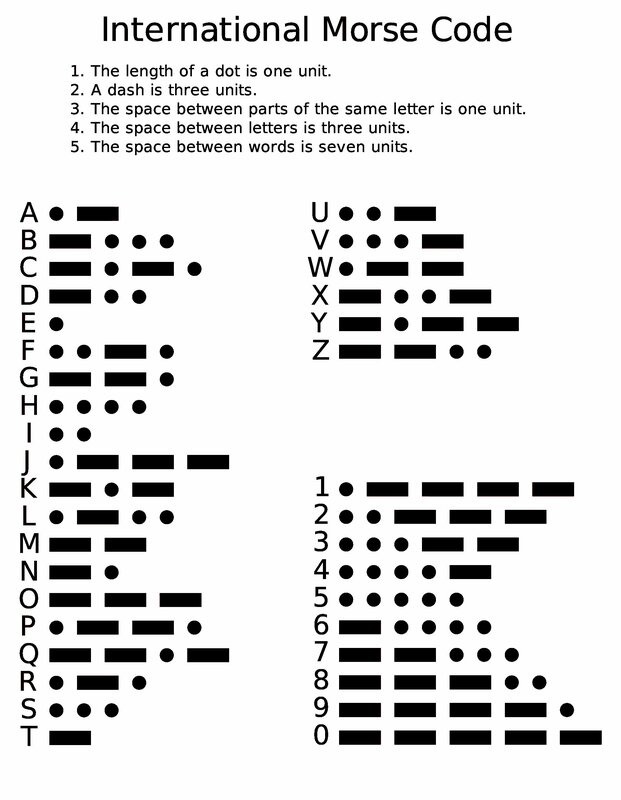 Convert text to a morse code string with dots and dashes. Create your own morse code with the dot() and dash() functions. Use standard Print methods like print() and println() to generate morse code on the defined digital output pin. Based on the ITU-R M.1677-1. Generates morse code for all the single characters listed in chapter 1.1.1, 1.1.2 and 1.1.3 (except for the accented e). Undefined/unknown or not printable characters will just be ignored. Download the zip file and read here for: How to install the Morse library. None hardware to be assembled. keywords.txt - Keywords from the morse library to be highlighted in the Arduino IDE. library.properties - Properties for the Morse library. Morse.cpp - The Morse library itself. Morse.h - The header file to be included in your source sketch. examples/DOT/DOT.ino - Example sketch using the dot() and dash() to create the morse code for "SOS". examples/SOS/SOS.ino - Example sketch using print to send morse code. examples/STR/STR.ino - Example sketch to create a text string with morse code. Morse - The Morse class to be used in your sketch. Create a morse object, dot duration and frequency can be given if the default values are not wanted. begin(pin) - Initialize the morse object using this digital output pin. begin(pin, duration) - Initialize the morse object using this digital output pin and duration. begin(pin, duration, frequency) - Initialize the morse object using this digital output pin, duration and frequency. dash() - Create a morse dash signal. dot() - Create a morse dot signal. getPin() - Get the current settings of the duration, frequency and digital output pin. string(str, max, txt) - Create a string with dots and dashes for the given input text. str - The string buffer where the morse code dots and dashes are returned. The function also returns a pointer to this string as a function return value. max - The maximum length of the str buffer. The conversation stops when the buffer is filled. txt - The actual text that shall be converted to morse code. wait(type) - Generates a pause with the correct duration for the given wait type. write(ch) - Internal low level function, not to be called. morseTable - Table with all the morse codes. _frequency - Keeps the current settings. findStartOfMorseCode(code) - Finds the start of the given morse code. getMorseCode(ch) - Finds the morse code for the given character. trace(...) - Internal trace function.